The PA Breast Cancer Coalition (PBCC) represents, supports and serves breast cancer survivors and their families in Pennsylvania through educational programming, legislative advocacy and breast cancer research grants. The PBCC is a statewide non-profit organization with a board of directors and a network of volunteers across the state. The PBCC exists to help the over 13,000 women in this state who will be diagnosed with breast cancer this year, to support the families of the 2,200 women who will die from it and to serve as a resource for the hundreds of thousands more women currently living with the disease. 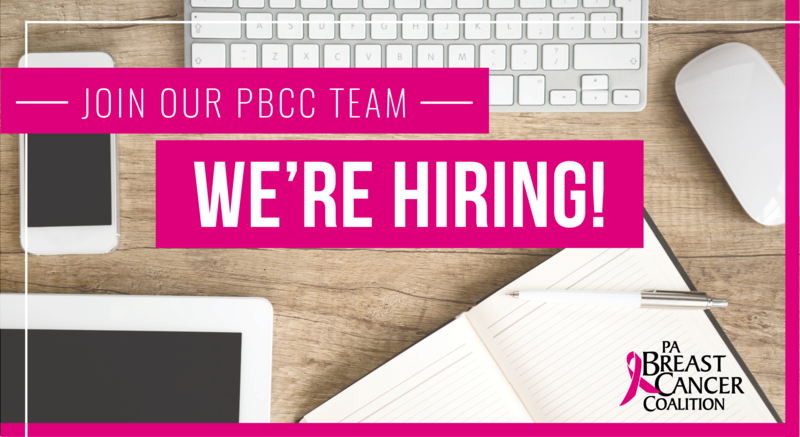 The PA Breast Cancer Coalition is seeking a highly motivated, experienced, energetic professional with excellent communication skills to work full-time (40 hours per week) in the Lebanon, PA office. The Data & Administrative Coordinator position provides an opportunity for an exciting, challenging and rewarding career. This person is responsible for the overall constituent and data management of the PBCC. The Data & Administrative Coordinator will work with all PBCC staff members to help keep the office running smoothly. We are looking for an ambassador, a team player, someone who can work with different personality types and is outgoing. We need someone who's friendly, organized, detail-oriented and is willing to help with projects as needed. This person is responsible for performing a wide range of program, administrative and workplace tasks. He/she will have the ability to organize and manage multiple projects simultaneously; problem-solve and trouble-shoot; interact well with all levels of staff, board and volunteers; and assist staff with both routine and special projects. This position offers a competitive non-profit salary and excellent benefits including health, dental and vision insurance, retirement plan, tuition assistance and life insurance. The salary range is $30,000-$34,000 and is dependent on education and experience. Please submit the following to Jobs@PABreastCancer.org with “Data & Administrative Coordinator” in the subject line.